I was born in Sarajevo, Bosnia. When I grew up there, we were kind of a little bit different from today’s generation, we used to always be outside playing whatever sport we could come up with, whatever sport it was. I started playing basketball at a young age. I think I started at six or seven when we would have organized games against kids from other parks, it was a lot of fun. Eventually as an athlete I started to really improve, and I loved being a part of a team. The Yugoslav wars broke in different provinces: Croatia, Serbia… and in 1992, right in my backyard. I lived in Sarajevo for nearly two months when the war began. The war was just like how you see it in the movies. You couldn’t really leave the house, and if you did you would hear the sirens go off to tell you to go back to your house because the bombs were going to start falling and it was get to shelter or risk your life. It was right there, and this was the daily life. As a kid, you couldn’t go to a park to play because that day you need to stay in, it’s too dangerous to go outside. Other days it seemed as though it was fine to go out, but you never truly knew and the thing with civil wars is that a lot of people think it’s gonna end soon. In some cases, this may be true except it wasn’t that way for us. Bosnia and Herzegovina were engulfed in conflict for nearly three whole years. I remember certain things from my time in Sarajevo. My friends and I, we would collect bullets and shell cases from the park, so many that I used to have a full bag at home. One day my dad brought me a big bullet that he found in his chair at work. He just went into his office and it was in his chair, it was in the chair. This was what our life was in Sarajevo. Eventually this life became too much for my family, we couldn’t go on with bombs raining over our home. They didn’t allow adults to leave, they kept them in wartorn areas to use them for labour. My father was forced to go and dig bunkers by hand, they give you shovels and you dig bunkers for the army. But they were allowing kids to leave in order to be a little bit humane, to make sure they don’t get hurt. I was 11, and my older sister 19, when my parents made the decision to send us away for our own safety. I was sent to Belgrade, Serbia to live with relatives. This was the safest place for us to be at the time. It wasn’t an easy time, at that age, but I was happy to go to school and to play basketball. The hardest for me was being away from my parents. Phones weren’t working, there was no electricity either, we went these long stretches without hearing from them. I remember getting word of bombs falling wondering if my parents made it. We lived in Belgrade for a year and a bit without my mother, and then she was allowed to leave. It took two years total before we were reunited with my father. During that time, I kept going to school and playing basketball as I had been back home but I was without my parents at the age of eleven, my life was no longer the same and it was very difficult for me. I used basketball to tune everything out, nothing else mattered during those two hours of playing. I started playing for KK Crvena Zvezda (Red Star) in Belgrade. Think of it how you would think of Real Madrid in Spain. One of the biggest accomplishments for a Spanish soccer player would be to play with Real. Where I’m from, as a basketball player you would think of Red Star and Partizan, those were the top two clubs. They play in the Euroleague, which is extremely popular back home, so this was a big highlight for me at that age to play for that club. I will never forget the first time I put the Red Star jersey on, I was like wow this is like a lifetime memory. To be there and to play for that club for two years was incredible, I thought I was a professional basketball player. I was in love with basketball. As soon as my dad came to Belgrade, in 1994 when he was able to escape, we applied to come to Canada as war immigrants. We were allowed one suitcase each and that’s where our new life started. When I came to Canada, I didn’t speak English or French, it was hard to communicate with people, but basketball was the tool that helped me make friends early on. In my high school, I remember we had a guy from Brazil, a couple guys from my country, Canadians, and a couple of guys from the Philippines. When you get here as an immigrant you realize that Canada is such a multicultural country. There is a reason why families move to Canada when they’re in a situation like my family was; so they can have a better life, so my sister and I could have a better life. I’m so grateful for my parents, if it wasn’t for their sacrifice and if it wasn’t for them leaving everything behind, I don’t know if I would have lived the same life I’m living today. It wasn’t easy. During the war, you don’t get to sell your apartment, you just leave. You pack your bags, leave your car, your house. You leave everything, and you just escape. I used basketball as much as I could to make friends, to meet people, to get a better education, and in that sense basketball helped me a lot. After I finished high school, The Cegep de Sherbrooke Volontaires were the only AAA team that recruited me to play. Back then, it wasn’t like now where you can send a video of yourself playing in five minutes from anywhere around the world so they can see you play. Being a student-athlete in Sherbrooke was another life changing experience. We’d been in Canada for just four years and my parents were like “we just moved here to be all together and now you’re leaving again to another city to go play basketball.” But they supported me every time I had a game, they still do even now in my years as a coach. They’ve never missed a game, I’m very grateful for their help and support. Playing in Sherbrooke helped me grow as a person. I had to be independent, cook, clean, do the laundry, do homework, play basketball, and find time to work a little bit here and there. It was a great opportunity because I was able to grow pretty fast and learn how to deal with certain things that life threw at me. I remember I went and handed in my tape to Concordia’s then head coach John Dore. I also sent it to Ottawa University and McGill. It was down to those three schools. School-wise I was a pretty good student, and then it went more down to McGill. McGill’s coach wasn’t sure if he had a spot for me and both Ottawa U and Concordia wanted me. When I went and met with coach Dore, he believed in me and he told me: ‘ If you come here, we’re gonna develop you as a person and get you ready for real life after basketball’. I truly enjoyed my experience as a student-athlete at Concordia. 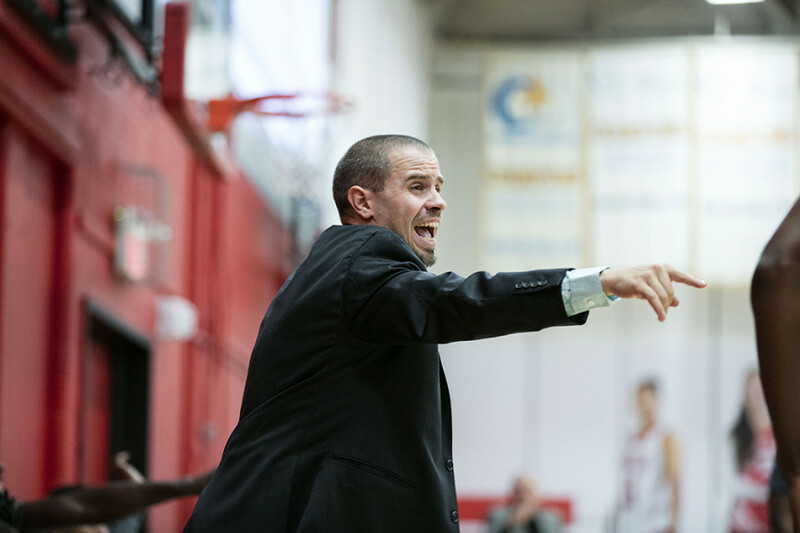 I started coaching high school while I was a student, my old friend and Concordia alumni Daniel Lacasse said that he needed help coaching two teams. I just went to practice and started getting involved and it was kind of a great experience. I thought ‘okay I like coaching, this is fun’. I wasn’t just coaching because of the highlights and the dunks, I always loved watching basketball. For me, it was the only way I could get an opportunity to learn. To become a head coach at this level, you gotta put in the time, especially in Canada. There are only 47 universities that have full-time head coaches which means that there are only 94 jobs if you combine the men and women’s positions, with 35 million people in this country. Coach Dore always told me that he wanted me to coach at Concordia, but when I graduated, I was still friends with a lot of the guys in the team. Because of this, I needed a couple years for the transition. It’s crazy that I’m only the third coach to ever coach the Concordia men’s basketball team but again.. the two previous coaches were very successful so there was no need to change. I learn every day on the job now, I’d like to say, you hear it a lot, ‘it’s a different generation of players so as coaches we must adapt. 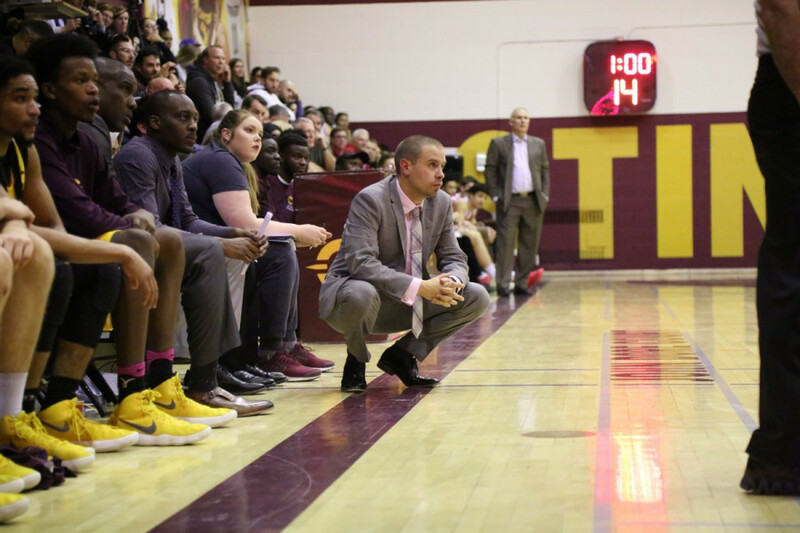 Who would’ve thought such a terrible war story would have so many positive lifetime memories, like playing for Red Star back in Serbia, getting a chance to compete for a National Championship with Concordia back in 2005 and now being a head coach for the Stingers. Once my kids are a bit bigger, I’d like to take my whole family back to Bosnia, Serbia and Croatia. I want to show them where I was born, where everything happened and where everything started.